The Sea Star, a twin screw Ranger 40, was built in Taiwan and brought into Australia for the fitting of the engines and all accessories. The Sea Star is an aft cabin model with stainless steel lifeline stanchions all around and a teak rail on top. It has a fly bridge with a helm station and controls, plus VHF, Autopilot and two Satnav/Chartplotters, bow-thruster and trim-tab controls. There is a soft Bimini top and clear side curtains, a helmsman's seat and settees port and starboard, and across aft is a targa bar on which mounts the radar scanner, deck light and some of the antennas. The bridge helm position has a VHF radio outlet in addition to the main radio, a large screen Furuno depth-sounder with a special high-power 1kw transmitter with the ability to identify fish clearly at over 1000 ft depth, two bridge trackplotters, a Simrad and a large screen Seiwa, master Simrad (Robinson) autopilot control, Plastimo compass and full Volvo engine controls for the TD. The accommodation consists of a wheelhouse amidships, with aft cabin and fly bridge on top. Cable locker forward, with access through the forward bulkheads in the foc'sle, berths port and starboard, with a drop in aft to form a large double berth, with shelves outboard, also an athwartships berth on top forward. There are cupboards and drawers under the berths. Aft to starboard there is a wardrobe with a shelf on top and a light in the wardrobe. Aft there is a door into a lobby with a galley to port, a twin bowl stainless steel sink, benches, 3 plate electric stove with grill and oven, microwave oven, eutectic fridge and freezer, drawers, cupboards, lockers and racks. To starboard is the enclosed head with an electric marine toilet, vanity basin, with a locker under and a 'telephone' shower. Then there are steps up to the wheelhouse and saloon, with the controls and instruments to starboard with a sliding door to the weather deck. The ICOM -HM 129W radio is installed across overhead, with the radar, Simrad autopilot AP16, Simrad AP26 & 27, SEIWA Track-plotter Barracuda, Furuno colour sounder installed at the lower helmsman's station. A slide-in bottle storage is installed under the helmsman's seat. A flat-screen TV is installed in the main saloon, with a special multi-directional ariels. Lifesaving apparatus is throughout the vessel, lifejackets, various flares, 6-8 floatation vests, smoke and other emergency devices and a 4 man liferaft is provided in the forward bridge locker, with other lifesaving devices. Aft there are settees, which return across aft, where there is a bench with 3 drawers under and stowage under the settees. There is a folding table with folding leafs, which drops down and form a double berth. To port forward, there is an athwartships bench with a drop down extension and 2 lounge chairs. Aft is a sliding door to deck and then a bench, lockers and drawers. Aft and slightly to port there are steps down to the aft cabin where there is a locker to amidships and a large locker to port which is plumbed and wired for the installation of a washing machine and dryer, if required. In the aft cabin, there is an island double bed, with bedside lockers port and starboard. There are also benches, with lockers and drawers under and behind, with a shelf on top, along fore and aft. To starboard forward there is an enclosed head, with an electric marine toilet, vanity basin with a locker under and an enclosed shower bay over a small bath as the shower base. The access to the engine room is via a door under the steps at both the fore and aft ends of the saloon, and also down through 5 hatches in the saloon sole. The "Sea Star" is fitted out with bright teak finish throughout including the soles, which is in a laid teak and highly polished finish. The upholstery is in a quality fabric, with a lage scatter rug on the sole. Carpet is laid in the aft cabin. Major work was carried out replacing both engines in late 2009 from 165 hp units with 370 HP Volvo Penta TAMD 73s. The Genset has been replaced with a new Kubota Diecon engine which has only run for about 50 hours. Bimini clears and sun shades have been installed and provision made for a new RIB tender mounted on a Weaver Snap Davit stainless steel mount on the swim platform. The RIB with a new 3.5 HP 2 stroke motor is available with the vessel if required. 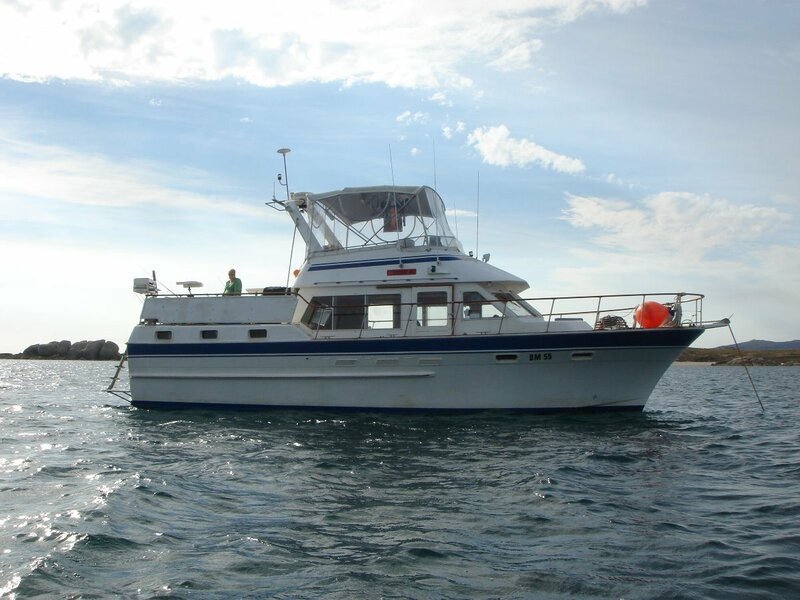 Because the vessel has been used extensively during the past few years for diving in the Flinders Islands, and around the South Australian coast, a specialised diving ladder has been installed to facilitate divers entering and exiting the water. The winch is electric with control positions both on the bridge and lower deck stations. The anchors are CQR, with chain and high-strength nylon fitted to the spare anchor. Shore power cable is provided with long heavy-duty lead and additional cleats have been installed both port and starboard. The vessel has numerous warps provided around the ship, with mooring lines of special high-strength nylon, both aft, forward and midships. All 5 batteries have been replaced, including 2 x AGM batteries for the Vessel's 12 Volt supply. A new 50 Amp Automatic Battery Charger and a new deck wash pump has also been fitted. An Evakool 125 litre Fibreglass Esky together with seat cushion and cover has been installed on the aft deck, along with an additional ice-box/seat/bait tray. Additional fishing rod holders have been installed for trolling and two bait-boards fitted, port and starboard. A Sovereign Stainless Steel Barbeque has been installed over the aft rail. A new TV with a DVD has been installed in the Aft Cabin. In October 2010 all antifouling was removed and the hull below the waterline was taken back to the original Gel Coat. This work was supervised by a Marine Surveyor and the hull was found to be in excellent condition and free from any sign of osmosis. The hull was then sealed with three coats of epoxy before antifouling was applied.